Essendo con quanta breuita � stata po�ibile uenuto al fine di quello che per la uera scienza della spada si pu� trattare, pare cosa conueneuole, uenendo dal semplice al composito, trattar di quelle armi prima ceh dalla spada sola in fuori sono o piu semplici o meno composite, & di quelle principalmente che piu hoggi di s�ufsano, & nelle quali piu gli huomini si esercitano, le quali sono la spada accompagnata dal pugnale, che � accrescimento si in offesa a come in difesa. Having as briefly as I might possibly finished all that which might be said, of true knowledge of single Rapier: it seems convenient, that coming from the simple to the compound, I handle these weapons first, which from the Rapier forwards are either most simple or least compound: And especially those which now adays are most used, and in the which men are most exercised, the which weapons are the Rapier and Dagger accompanied together, and are a great increase and furtherance both in striking and defending. Onde � da auertire che si pue in quests & simili arme esercitar quel tanto desiderato & apprezzato modo di schermire, che si dice pararare & ferir in uno istesso tempo, il che si ha per impo�ibile nella sola spada, anchor che cosi non sia. Perche sono alcuni colpi nella difesa de quali s�offende come sono i tagli dritti & riuersi alti & ba�i, & de gli alti che hora si tacciono, in queste arme dunque per potere una agiutar l�altra, su puo con gran comodit� difendere, & ferire. Wherefore, it is to be first considered, that which these and the like weapons, a man may practice that most desired and renowned manner of skirmishing, which is said to strike and defend both in one time, which is thought to be impossible to be done with the single Rapier, and yet in truth is not so: For there are some kind of blows in the defense of which one may also strike (as in the blows of the edge, down right and reversed) both high and low, and other high blows which here are not spoken of. Onde si deue auertir, che essendo queste arme due & di minor quantit� l�una d l�altra, che a ciascuna si deue dar quella parte di difesa & offesa che puo sopportare, per� al pugnale, per esser corto, si deue dar tutta la parte sinistra da diffendere sino al ginocchio. Et alla spada tutta la parte destra & la destra & sinistra insieme dal ginocchio in gia, ne deue parer strano che il pugual solo debba difender tutti colpi dalla parte sinistra; percioche facili�imamente il pugnale sostiene ogni gran colpo di taglio quando si uuol andar ad incontrar la spada nella prima & seconda parte, ma non si deue gi� alcuno a�icurar di sostenire con il solo pugnale in contrando la spada nella terza & quarta parte, essendo quelle di troppo gran forza & da non esser sostenuta dal solo pugnale. Ne percio sideue alcuno asseufare di riparare i colpi con la spada & pugnale insieme, il qual modo di difender e hoggi da tutti usato credendo per tal modo di meglio a�icurarsi ancor che cosi non sia, percioche si mette la spada & pugnale in ser uitu talmente che non si puo offendere se prima non si riscuotono l�armi, onde qui si consumano doi tempi, sotto i quali si sarebbe ferito quando quello che ferisce cintinuando per la linea retta non abbandoasse il cresere uedendo l�inimico impazzato a difendersi, & se cio non si � ueduto molte uolte in fatto � perche non si consote questo auantaggio, o conoscendolo non sono presti ad esequir, o temono lasciando. But yet let no man assure himself, to bear any blow, with his only Dagger when he meets with the sword on the third and fourth part thereof, because that part carries more force with it then may be sustained with the only Dagger. 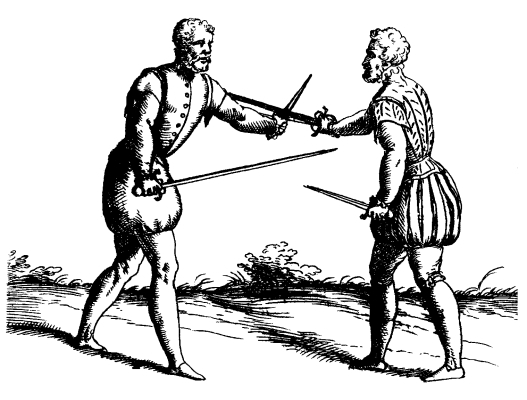 And yet for all that, no man ought to accustom himself to defend blows with the Rapier and Dagger both together, which manner of defending is now commonly used because men believe, that they stand more assuredly by that means, although in truth it is not so. For the Rapier and Dagger are so bound thereby, that they may not strike before they be recovered, and therein spend two times, under the which a man may be struck when he strikes continuing by the straight line, increasing forwards, perceiving his enemy to be occupied and troubled in defending of himself. And albeit this is not seen to come to passe many times, yet that is because the advantage is not known, or being known, men either ready to execute it, either stand greatly in fear to do it. Dunque quel modo di riparare si user� di oppore una sola arma alla spada inimica tenendo l�altra libera da poter a suo piacer offendere. Et molto � da aueetire che con il solo pugnale non solo i colpi di spada ma di qualunque altra arma anchor che grandi�ima si possono sostenire & difendere, quando si a�icura di andarli ad incontrar uerso la mano. Therefore leaving aside this manner of defense, let each man use to oppose, one only weapon against the enemy's sword, keeping the other free, that he may be able to strike at his pleasure. And it is diligently to be noted, that not only the blows of the sword, but also of any other weapon be it never so great, may with the only Dagger be sustained and defended, when a man does boldly encounter it towards the hand. Deuesi anco sapere, che con minor perice lo si pu� in quest�arme trar colpi di taglio, che nella spada sola percioche, quantunque si muoua la punta della spada dalla linea retta, non percio resta libero potere all�inimico di ferire, essendoui un altra arma contra preparata per difendere, ilche non auiene nella sola spada, laquale alluntanandosi per ferire di taglio appresenta, & da modo all�inimico do giungere prima. Ne gia per questo darei consiglio ad alcuno, che o in questa ouero in altra sorte d�arme s�auezzasse � trar colpi di taglio; percioche si puo sott�e�i facilmente ferir di punta. It is therefore to be known, that in the handling of these two weapons one may with less danger give a blow with the edge then at single Rapier: For albeit the point of the Rapier be moved out of the straight line: yet for all that there is not free power given to the enemy's to strike, considering there is an other weapon contrariwise prepared to defend: but this does not so fall out at the single Rapier, which bearing itself far off when it strikes with the edge, does present and give the means to the enemy to hit home first. And yet for all that, I would not counsel no man, either in this or in any other sort of weapon to accustom himself to give blows with the edge: for that he may under them be most easily struck with a thrust. Si sogliono in quest�arme porre molte quardie; delle quali sendone molte che non banno ragione per cioche o sono fuori della linea retta, o si puo sotiesse facilmente e�er ferito lequali tutte come danose, & n� t�uenieti pute al proposito nosiro lasciero da parte ristringedomi a quelle tre sole co le quali si puo facilmete offedere et difendersi, le altre tutte facilmente a queste tre si possono ridurre. In the handling of these weapons, men use to frame many wards, all which, because many of them carry no reason, for that they are ether out of the straight line, either under them a man may be easily be struck, I will cast aside as impertinent to my purpose, and retain myself unto those three with the which a man may safely strike and defend, whereunto all the rest may be reduced. DEL MODO DI RIPARARE COL PVGNALE. Altrove ho detto quella parte della persona, che deue defendere il pugnale esser la sinistra cio�; dal ginocchio in su. Ma la parte piu bassa inseme con la destra uuole tuttoa esser difesa dalla spada per piu commodit�, & sicurezza. I have said elsewhere that the left side of the person is that part which the dagger ought to defend, that is to say, from the knee upwards: the lower parts together with the right side ought wholly to be warded with the sword. Quanto a quello che si ha da fare co�l pugnale si deue auertire, che per grandi�imo auantagio, il pugnale uuele esser tenuto inanti co�l braccio desteso, & con la punta, che guardia l�inimico , la qual punta, benche sia lontana dall offesa pur per esser punta da da pensare all�inimico. Considering the dagger, that which is to be done therewith, it is to be noted, that for great advantage, it would be held before with the arm stretched forth and the point respecting the enemy, which although it be far from him, yet in that it has a point, it gives him occasion to bethink himself. Se si debba poi tenire il pugnale co�l taglio, o con la faccia uerso l�inimico, cio si puo rimettere algiuditio di chi l�adopra secondo che li torna piu auantagio. He ueduto alcuni, che lo teng no co�l taglio uerso l�inimico allegando in suo auantagio, che incontrando la spada che uenga di taglio, o punta ne la prima, & seconda parte, crescendo un passo inanti di nece�it� uolta la mano, & meite il taglio del pugnale, oue prima era la faccia, di modo che uine aspingere la spada inimica lontana da se senza fatica molta percioche ogni peco di moto nelle prime parti della spada causa molta uariet� nella punta di doue principalmente uienel offensa nel qual caso sarebbe molto utile un pugnale largo. Now whether a man ought to hold his Dagger with the edge or flat towards the enemy, it may be left to judgment of him that handles it, so to use it, as shall be most for his advantage. I have seen some, who bear it with the edge towards the enemy, alleging this to be their advantage, that as they encounter the enemy's sword (which comes with the edge or point) in the first or second part thereof, and therewithal do increase a pace forwards, of force the hand turns and places the edge of the Dagger there where the flat was first: So that they are to drive the enemy's sword far from them without any great trouble, because each little motion in the first part of the sword causes very great variety in the point, from which principally proceeds the hurt. In which case, it shall be very profitable to have a good large Dagger. Altri sono a quali piace di tenir il pugnale con la faccia uerso l�inimico, sereundosi per difesa non solo del pugnale, ma delle guardia ancora di esso pugnale con la quali dicono che si fa presa d�una spada, & per cio fare piu facilmente, hanno i loro pugnali, i quali oltra l�else ordinaire hanno anchora due alette di ferro lunghe quatro ditta dirrittte distanti dal pugnale la grossezza d�una corda d�arco, nella quale distanza quando auiene, che ss gli cacci la spada inimica, e� subito uolgendo la mano stringono la spada facendo prese di essa, la qual cosa puo essere cheriesco, ma io l�ho per piu imaginabile, che per fattibile essendo che nel feruore dell�arme, ou c�trasta lo sdegno co�l timore poco si discernese la spada sia nell�incastro o non & quando pure si ha da discorrere, & mantenir combatendo il guidito uiuo. Bisogna igegnar si di cio fare col conoscere accuram�te, et discernere con prudeza i moti dell�inimico , la uicin�za & l�tan�za, et rissoluersi di ferire per la piu corta che quindi nasce la uittoria. There be other some, whom it pleases to carry their Dagger with the flat towards the enemy, using for their defense, not only the Dagger, but also the guards thereof with the which (they say) they take holdfast of the enemy's sword : and to the end they may do it the more easily, they have daggers of purpose, which beside their ordinary hilts, have also two long sterts of Iron, four fingers length, and are distant from the dagger the thickness of a bowstring, into which distance, when it chances the enemy's sword to be driven, they suddenly strain and holdfast the sword, the which may come to pass, but I hold it for a thing rather to be imagined then practiced, the case so standing, that in the heat of fight, where disdain bickers with fear, little does a man discern whether the sword be in that straight or no. And when he is to premeditate and mark, endeavoring and striving in his lively judgment, he must advise himself to perform it with exquisite knowledge and perfect discerning of the enemy's motions, his nearness and farness, and to resolve himself to strike by the shortest way that may be: for therechance springs the victory. Tenira dunq ciascuno il pugnale col taglio o faccia uerso l�inimico, sec�do che co�l pugnale si puo ferire di taglio il che non auiene nell�altro modo ma tengasi come si uoglia si deue tenir il braccio disteso inanit con la punta al modo detto per poter trouare la spada molto in�ti che ella gi�ga alapersona. Let every man therefore hold his dagger with the edge or flat towards the enemy, as it shall most advantage him, or as he has been most accustomed. True it is, that by holding the edge towards the enemy there is this advantage to be gotten, that with the dagger he may strike with the edge, which he may not do the other way. But let every man hold it as he will, yet he ought to carry his arm stretched out before him, with the point in the manner aforesaid, to the end he may find the enemy's sword a great deal before it hits his person. Si deue oltra cio hauere o ordine infallibile, che qu�do uiene p�ta o taglio nella parte sinistra, fa dibisogno trarli foura co'l pugnale dalla parte sinistra. Et cosi difendendoli con la spada farli uscire dalla parte destra, perche altramente facendo cio� spingendo fuora di copi sinistri dalla parte destra hauendo la spada inimica oltra il motto di trauerso che gli si da per trarla fuora il retto anco ra che gli da l'inimico, continuando l'uno & laltro pu� essere che giunga il moto retto in qualche parte della persona prima che il moto di trauerso la spinga fuora, per� si traran sempre fuora i colpi inuerso quella parte di uita che � minore, affine che piu presto esca del periglio quelli colpi che uenir anno dalla banda destra spingerli dalla destra. Et quelli che ueniranno dalla sinistra far parimente che escano dalla sinistra. Besides this, he ought to observe for an infallible rule, that when the point or edge comes on the left side, he must beat it from that side with the dagger. And in like sort defending himself with the sword, to drive it from the right side, for doing otherwise : that is, if he force the blows given on the left side outwards on the right side (forasmuch as the enemy's sword has by that means two motions, the one crossing, which is already given, the other straight which the enemy gives it, continuing the one with the other) it may be, that in the straight motion, it may hit the person, before that (by the thwart or crossing motion) it be driven quite outwards. Therefore all blows shall be beaten outwards toward that side or part of the body which is least to the end it may sooner avoid danger. And those blows that come on the right side must be beaten towards the right side : and those on the left side must in like manner be voided from the same side. Della forma de pugnali tanto si ha da dire, che uogliono essere per sostenire i colpi della spada forti, & per incontrarla facilmente longhi, & per poterli presto trar del fodro uorebbeno esser corti onde s'elleg�ran no mediocri. Now, as concerning the fashion of the Dagger, thus much is to be said : that it would be strong, able to bear and encounter the blows of the sword : indifferently long : that it may be quickly drawn out of the sheath somewhat short : and those that are of the middle size would be chosen. ESSENDO questa guardia naturalmente prima si come ho detto nella sola spada, sar� conuencuole l'incominciar da questa, la quale in quest'arme, si pu� formare in duo modi,l'uno con il pi� dritto inanti, ilquale dimanderemo primo, l'altro con l'istesso piede indietro, ilquale s'adimander� secondo, & questo per hauere la punta della spada piu luntana da l'inimico , uiene ad hauere bisogno di maggior tempo, ma il primo, per essere piu d uicino, con la sola cresciuta del pie dinanzi serisce piu presto, ma non gi� contanta forza, come il secondo, ilquale ferendo con il passo retto, aggiunge alla forza del braccio , & della mano, anco la forza di tutta la uita . As in handling the single Rapier, so likewise in this, it shall not be amiss to begin with the High ward, which in managing these two weapons may be framed after two sorts. The one with the right foot before, which I call the first : and the other with the same foot behind, which I will term the second. This second requires a greater time, because the point of the sword is farther off from the enemy. The first (being more near) with the only increase of the foot forwards, strikes more readily, yet not with more forcible than the second, which, when it strikes with an increase of a straight pace, joins to the force of the arm and hand, the strength of the whole body. Cominciando dunque dalla prima, come da quella in che piu facilmente l'huomo si ritruoua dico che si de ue in questa, uolendo stare ne i termini della uera arte trar solo la punta con la cresciuta del pie dinanti , fermandosi in guardia bassa. Beginning then with the first, as with that which each man does most easily find: I say, he ought if he will keep himself within the bounds of true Art, to thrust only with the increase of the foot forwards, settling himself in the low warde. Et nel secondo modo il quale si forma con il pie diritto indietro, & la spada in alto con il pugnale inanti tenendolo nel modo detto, in questo similmente si deue spingere solamente la punta con la maggior furia che si pu� con la cresciuta d un passo retto, fermand si pure in guardia bassa. Ne si deue in quest'arme asicure di trar colpi di taglio per sapere d hauere in mano un' arma da difendersi, perche il medesmo auantagio ha quello, che difende di poter con una arma difendere, & for fe con la piu debole, & ferir con la piu gagliarda ,la quale uien p i riparata con fatica da quello c'haueua gia posto ogni forza, & potere p�r trar un colpo di taglio, onde poca uirtu gli resta da difendere un gran de incontro per�, si procurera di ferir di punta. In the second way, which is framed with the right foot behind, the sword aloft, and the dagger before, and borne as aforesaid, he ought in like sort discharge a thrust as forcible as he may, with the increase of a straight pace, staying himself in the low ward. Neither ought any man in the handling of these weapons to assure himself to deliver edgeblows, because he knows that there is an other weapon which defends : For he that defends has the self same advantage, to wit, to be able to with one weapon (and happily the weaker) to defend himself and strike with the stronger. The which stroke is painfully warded by him, who has already bestowed all his force and power, in delivering the said edgeblow, by means whereof, because there remains in him small power to withstand any great encounter, let him provide to thrust only. Di tutti � della maggior parte de tagli, si da offesa come di difesa se ne tratterr� abundantemente nell'inganno. Of all, or of greater part of the edgeblows, as well of striking as defending, I will reason at large in the Treatise of Deceit. Come cosa superflua lascio di dire la maniera conlaqua.,le si uietano i colpi ai taglio, hauendo di gia detto, che c� le p� te sipossono uietare tutti i colpi di taglio. per difesa dunq; delle due parte � grandi�imo au�tagio ritrouarsi in guardia bassa con il pie diritto inanti , il qual sito uenirai ad esponere all inimico la parte destra, nella quale egli drizzera le sue pute, alle quali si puo opponere in tre modi, cioe, � con il solo pugnale:, o con la sola spada, o con ambidoi inseieme; main ciascuno dessi si dee auertire di crescere un passo obliquoo, mediante il quale uiene arimo uere dalla linea retta quella parte de la uita nella qual si ueniua a ferire. To speak of the manner how to withstand the blows of the edge, having already said that all such blows may easily be warded by giving a thrust, I omit as superfluous. But for the defenses of both sides of the body: I say, it is great vantage, to stand at the low ward, with the right foot forwards which manner of standing, the right side is put forth toward the enemy, whereunto he will direct all his thrusts: and those may be encountered after three sorts, that is to say: with the Dagger only: with the Sword only: and with both joined together. But in each of them, a man must remember to increase a whereby that part of the body which is to be struck is voided out of the straight line. Quando si riparer� con il solo pugnale si crescer� il passo, il bracio inanti, & trouata la spada,si ferina con la cresciuta del passo diritto della punta bassa preparata. When one wards with his Dagger only, he shall increase a pace, and bear his arm forwards, and having found the enemy's sword, he shall (with the increase of a straight pace) strike him with a thrust underneath, already prepared. Se si difende con la sola spada, � di bisogno nel far il passo ,obliquo leuare la spada, portarla di fuora, ouero come si ha trouata la spada inimica ferir con il pugnale nelle temple fermando la spada con la spada, ouero in uece di ferir co' l pugnale, con esso fermare la spada inimica, & con quella' conia cresciuta de laltro passo diritto ferir a punta, ma � molto commodo il ferir del pugnale. When he wardeth with his sword only, it is requisite, that making a slope pace he lift up his sword and bear it outwards, or else, as soon as he has found the enemy�s sword, that with his dagger he strike at the temples of his enemy�e head, staying his sword with his own: or else instead of striking with the dagger, therewith to stay the enemy�s sword, & and with it, (increasing another straight pace) to deliver a thrust: but it is very commodious to strike with the dagger. Il terzo mod dopo il passo obliquo poscia che si ha trouata la spada inimica, deue fermarla co'l pugnale, cauandone la spada ferire di punta di sotto con la cresciuta del passo retto. The third way : As soon as he has made the slope pace, and found the enemy's sword, he ought to stay it with his Dagger, and therewithall, withdrawing his own sword, to discharge a thrust underneath with the increase of a straight pace. Per uniuersale precetto ho dato in ogni arma & in ogni guardia, che no si debba per procurarsi auantagio ouero p fe�rir piu presto linimico, trar colpi di taglio et parim�te che c� facilit�, et c� poco pericolo si puo essere feriti sotto le coltellate. I quali precetti se ben si debbono in ogni luogo, & tempo osserrare, in questa guardia principalmente non si debbono giammai preterire, percioche in essa non si puo se non con grandi�ima discomodit�, et lungezza di tempo ferire di tagli�. In each weapon and ward, I have laid down as a general precept, that no man ought, (either for the procuring of any advantage, either for striking the enemy more readily) deliver blows of the edge. And in like sort, I have said, that easily and with small danger, one may be struck under any such blow : which precepts, as in each time and place, they ought to be observed: so in this ward principally they may not be forgotten. For a man may not without great discommodity and loss of time, strike with any edge blow, as he stands in this ward. Resta solo dunque di usare la punta, la quale si debbe trar con la cresciuta del pie dinanzi, auer tendo prima, che si spinga, se � po�ibile, battere la punta della spada inimica co'l pugnale. It rests therefore, that the thrust be only used, which ought to be delivered with the increase of the foot forwards, always regarding before it be given (if it be possible) to beat away the point of the enemy's sword with the Dagger. VESTA ancora si come, l'altre punte, si pu� in tre modi difendere cio� o co'l solo pugnale, o con la sola spada, o c� ambidoi insieme, ma per difendersi in qual si uoglia modo � utilisimo il ritrouarsi in guardia bassa & quando si parer� col solo pugnale, si douer� crescere il passo obliquo, & trouata co'l pugnale la spada inimica ferire subito d'une punta dissotto con la cresciuta del passo, retto. This thrust as well as the other may be warded after three sorts, to wit: with the Dagger only, with the sword only, and with both joined together. But for a mans defense in any of these ways, it is good to stand at the low ward. And when he wards with the dagger only, he must make a slope pace, and finding the enemy's sword, with his said dagger, discharge a thrust underneath with the increase of a straight pace. Et difendendo con la spada sola che d il miglior d'ogn'altro modo per ferir l'inimico & difendere se stesso bisogno opponere il filo alla spada inimica & spingere la punta alla faccia girando pur il pie di dietro incerchio , per allungare piu la punta, & meglio a�icurarsi. And when he wards with the sword only (which is the best of any other, both to strike the enemy, and to defend himself) he must oppose the edge of his sword against the enemy's, and drive a thrust at his face, fetching a compass with his hindfoot, both for the lengthening of the thrust, and assuring of himself. Con l'una& laltr'arma insieme, � po�ibile opporsi punta. Ma questo � tanto discommodo , & sgarbato modo , che io come non conueneuole lascio di dirle. It is possible to withstand the thrust with the sword and dagger joined together : but it is so discommodious and so ridiculous a way, that I leave to speak thereof, as of a way nothing safe to be practiced. In tutte le guardie qual uolta si truoua con la punta uerfo l'inimico, � grand�imo disauantagio il ferire di taglio, & se in modo alcuno � pur lecito ferire di taglio, � quando l'huomo si ritruoua in questa guardia bassa, percioche torna commodo, et f consuma poco tempo � trar qualche taglio tra le punte, ouero trahendo pu� facilmente, presto per tentare l'inimico trar un taglio di nodo, nel quale, & si consuma poco tempo, et si leua poco la punta dalla linea retta, di modo che dificilmente si pu� sotto questi tagli entrar a ferire, pur il non usarl sar� meglio risoluendosi piu prestoa trar una p�ta dopo una punta, che un taglio. In each ward, when one stands bearing the point of the sword towards the enemy, it does much disadvantage him to strike with the edge. And if in any sort it be lawful so to do, it is, when he stands at the low ward: For it is commodious, and there is spent but little time in the bestowing of an edgeblow between thrusts. or, the rather to try the enemy, there may be delivered an edgeblow from the wrist of the hand, in the which as there is spent little time, so the point is carried but a little out of the straight line, so that the enemy may very hardly enter to strike under either of these blows. But it is better, not to use them, resolving rather to discharge thrust after thrust, then any edgeblow. Questa guardia, si come l'alta, si puo formare in duo modi cio� con il pie dritto indietro, & ma quella con il pie diritto indietro e piu presto per aspettar l'inimico, che per esser prima a offendere , percioche l'offesa in questa , ancora che ella sia di gran forza, per esser la spada cosi lontana da l'offesa; alla quale prima, che giunga, consuma molto tempo. pu� facilmente' esser riparata, o con arme o con la ritirata d'un passo, pero dire di quella sola con il pie diritto inanti. In questa si puo ferir in duo modi , sendo dentro, o di fuori , dentro intendo quando la spada si truouatra la spada, & il pugnale de ! 'inimico; & di fuora quando ne sono alcuno d'essi in mezo a laltro . This warde may (as the high ward) be framed after two sorts, to wit: with the right foot behind, and the same foot before : but that with the right foot behind, is used rather to respect the enemy than to strike first. For although it carries great force by reason that the sword is far off from hurting, and before it hits home, it spends much time, yet the hurt thereof may be easily warded, either with the weapon, or by retiring a pace. I will speak of that only which is framed with the right foot before. And in this, one may strike two ways, to wit: either within or without: By (Within) I understand, when his sword is borne between the enemy's sword and dagger. By (Without) I mean, when any one of them is borne in the middle against the other. Ritrouandoti dunque di dentro a mela la spada dellinimico nel qual caso si ha la punta inimica, che uiene a ferir nella parte destra , si deue con gran uelecit� crescere il passo obliguo, & quasi retto per auicinarsi piu all�inimico, & subito serrando la spada inimica in mezzo alla propria spada, & pugnale & subito fermata crescere il passo retto & ferire di punta. When one finds himself within, at the half of the enemy's sword, the point whereof, is directed to strike at the right side, he must very swiftly increase a slope pace, and in a manner straight, to the end he may approach the nearer his enemy, and therewithall suddenly barring the enemy's sword in the middle with his own sword and dagger, increase a straight pace, and deliver a thrust. Si puo in un altro modo, & piu semplice ritrouandosi � meza spada battondo se prima si puo, con il pugnale la punta sell�inimica spada duori della linea retta � quella banda che torna piu commodo, & in quel tempo crescendo il pie dinanzi spinger con gran forza una punta alla facia o petto. This may be done after another plainer way, and that is: when he stands at the half sword, to beat the enemy's swords point out of the straight line on that side which shall be most commodious, and in that line increasing his foot forwards to drive a forcible thrust, at the enemy's face or breast. Ritrouandosi poi di fuori, si puo crescnedo il pie dinanzi spingere una punta all facio. La quale quasi di nece�it� uiene riparata dall spada dellinimico nel qual riparo si fuol portare la spada con la punta fuori della linea retta, nel qual caso si puo sicuramente crescendo il passo obliquo, uolger presto un riuerso alle gambe, & poi subito ritirando alquanto la spada spingere la punta ba�a con la cresciuta del passo retto. But standing without, he may (with the increase of his foot forwards) give a thrust at the face, which the enemy of necessity must defend with his sword : but therein the sword and the point thereof is commonly carried out of the straight line, in which case he may (with the increase of a slope pace) turn a reverse at the legs, and then presently something withdrawing his sword, deliver a thrust underneath with the increase of a straight pace. Si puo nel secondo modo trar un taglio diritto di nodo piu breue, & forte che sia po�ibile, non tanto per il ferire quanto la spada inimica, la qual subito trouata si dee crescendo il passo obliquo leuar la mano, & caceiar una punta all�ingiu con la cresciuta d�un passo retto. He may also after a second manner, give a right edgeblow from the wrist, as short and strong as is possible, not so much pretending to strike as to find the enemy's sword : And it being suddenly found he must with the increase of a slope or crooked pace, lift up his hand and drive a thrust downwards, with the increase of a straight pace. Nel terzo modo si puo anco ferire menando il detto nodo di mano, & trouata la spada inimica, crescere subito il passo obliquo, & fermarla con il pugnale, poscia subito cauatane la spada ferire d�una punta di sotto con il passo retto. After a third sort also, he may strike, and that is to deliver the aforesaid blow from the wrist, and having met with the enemy's sword, to make presently a slope pace, and stay the sword with his dagger, and then nimbly recovering his own sword, to thrust underneath with the increase of a straight pace. Et questo basti quanto � quello, che per di dentro, & di fuori si puo fare della spada, & pugnale in questa guardia uolendo quel solo che per la uera arte, & per la retta si puo fare. These be sufficient, concerning that which may be done in this warde with the sword both within and without, at least, for so much as may be done by true Art. Ancora che perdifesa de i colpi di ogni guardia uisia bisogno di grandi�ima consideratione, in questa nulla uimeno molto piu eccelente giudito, & prestezza, percioche questa guardia si oppone a tutte l�altre, & la maggior parte de colpi importanti piu che in ciascun� altra si ferma, & riposa, ne credo per altra cagi ne, che per conoscere di potersi in tal sito facilmente difendere, & offendere, & perche in questa come si detto nell offesa piu che in niun� altro modo torna comodo il ferir di taglio, ancora che non si sia datao per consiglio che sia buono usarlo; pure per poter facilmente accadere senc porra qualche difesa. Although in the defense of blows in each ward there is great consideration and heed to be taken: yet in this especially is required a far more excellent judgment and readiness in action. For this ward does oppose itself against all others. And the greater part of blows which are of importance, proceed from this ward. Besides, every man does naturally more accustom himself to stay and repose himself in it, than in any other. Neither is it (as I believe) for any other cause, then that he knows, by so bearing himself, he may easily both strike and defend. And because in this ward, as I have before said, in the hurt or offense thereof, it more commodious to strike with the edge than in any other ward, albeit, it is not there given for counsel to be good to use it. But yet because it may easily happen, there shall be here laid down some defense for it: calling this principle before any other to remembrance, (He that is nearest hits soonest) to the end, that knowing what way either sword makes, each man may resolve himself to deliver a thrust under an edgeblow, by the which is prevented the fall of the said blow. Affine che quelli ancora restino sodisfati che uogliono riparare tutti i colpi, & fare in duo tempi quello, che potrebbono fare in uno, poner� per cio la difesa del taglio. But because none, but such as are endued with deep judgment, great activity, and stout courage, do or may safely put this in practice: And to the end also, that those, who accustom to defend every blow, performing that in two times which might aswell be done in one, may rest satisfied : I will lay down the defense of the edgeblow. Ogni uolta dunque che uenirano colpi di taglio sarano dritti o riuersi, alti, o ba�i. Therefore, whensoever edgeblows are given, they are either right or reversed, high or low. Al dritto alto si oppone o il solo pugnale, o la spada & pugnale insieme . quando si oppener� il pugnale solo, si deue crescere il passo retto, leuar la mano dal pugnale per incontrare la spada inimica nella parte piu debole & subito trouata col pugnale la spada inimica crescere un passo dritto, & ferire della punta bassa preparata. E se si opponer� la spada & pugnale insieme siluer� la spada & pugnale insieme, & come si haur� incontrata l�ofessa, si taglier� d�un riuerso la faccia col spingere una punta alla coscia dell�inimico, la qual punta fa questo effeto che ferisce sotto il taglio al sicuro, & uiene ad essere come impedimente & sbarra alla spada inimica che non possa cader uolle gambe, uogliendo necessariamente nel spingerela il pie di dietre in giro nella parte destra. Against the right high blow, either the only dagger is to be opposed, either the sword and Dagger both together. When the only dagger is used, then a straight pace must be increased, and the dagger hand lifted up to encounter the enemy's sword in the weakest part thereof, and being suddenly found a straight pace is to be increased, and a thrust underneath (already prepared) to be discharged. But if the sword and dagger be both together opposed, they both must be lifted up, and as soon as the blow is encountered, the enemy's face be cut by discharging a reverse, with the only turn of the hand, resting and staying itself in the broad warde. . The right blow, given beneath, or below, must be warded after no manner, then by driving a thrust at the enemy's thigh, which thrust is to this purpose, that it hits home safely under that blow, and farther is a let, or bar, to the enemy's sword, so that it may not light on the legs, considering that in the discharge of the said thrust, the hindfoot must necessarily go compassing towards the right side behind. Il Riuersi ancora saranno o alti, o ba�i; se faranno alti si potranno difender, o con il solo pugnale spingende la punta bassa con la cresciuta, del passo retto poscia che si haur� trouata con il pugnale la spada inimica, ouero con la sola spada crescendo un passo retto col pie sinistro ferendo d�una punta gia inalzata per il riparo con la cresciuta pur del passo retto del pie destro; & questo modo di riparare � piu secondo l�arte, percioche si e detto che tutti colpi, che uengono dalla parte sinistra, si deueno ripara recol pugnale, & i destro con la sola spada. Reverses also, are either high or low. If high: they may be warded with the dagger only, therewithall discharging a thrust underneath, with the increase of a straight pace, as soon as the dagger has met with the enemy's sword. Either, they may be warded with the sword only increasing a straight pace with the left foot, therewithall discharging a thrust (already lifted up in the ward) with the increase of a straight pace of the right leg. And this manner of warding, is more according to Art, because it has been said, That all blows on the left side, are to be warded with the dagger only. Il riuerso basso uuol essere difeso col spingere una punta con la quale al sicuro si ferisce & si mette impedimento, & sbarra che la spada inimica non cada nelle gambe. In altri modi ancora questo si puo riparare, i quali tutti si diranno nell�inganno per non esser questo il fuo luogo. The reverse blow would be warded with giving a thrust which safely hits, and hinders the sword to light on the legs. This blow also, may be warded after each other and diverse manners, which shall be declared in the treatise of Deceit: for this is not their proper place. Nel riparare delle punte si deue hauer grandissima auertenza nel portar la uita fuor della linea retta percioche questo � il piu sicuro modo di difender queste punte che trouar si possa, per esser difficile da trouare queste punte, quando elle uengono serrate & con furia. Percio uenendo la punta di dentro, si deura nel tempo che l�inimico uuol ferire crescere un passo obliquo a�icurandosi co�l pugnale dalla spada inimica, & poscia ferendo di punta con la cresciuta del passo retto. There is great regard to be taken in warding of thrusts, to wit: to bear the body out of the straight line, because this is the safest way that may be found to void them, because it very difficult to meet with them, when they come barred and closed in, and are forcibly discharge. For when a thrust comes within (at the very time that the enemy strikes) he ought to increase a slope pace, ensuring himself of the enemy's sword with his dagger, and then to discharge a thrust with an increase of a straight pace. The thrust without is warded after the first manner, to wit, when the enemy strikes, to increase a slope pace (whereby the body voids danger) and to give a thrust with the increase of a straight pace. In this order one may warde himself from other ways of striking. & parimente quando l�inimico per tentare trara un taglio di nodo si sar� auertiti di subito tratto il nodo, crescer il passo obliquo & ferire di punta con la cresciuta del passo retto, pria che l�inimico dopo il nodo possa risoluersi di fare altri coplo. Et questo basti quanlo all�adoprare la spada, & il pugnale con auantagio, & ueramente. In like case, when the enemy (only to try and provoke) does deliver an edgeblow from the wrist of the hand: let every man be advised, as soon as the blow is delivered, to increase a slope pace, and deliver a thrust with the increase of a straight pace before the enemy (after his blow given) do determine to discharge any more. This may suffice, for the handling of the Rapier and Dagger truly, with advantage.